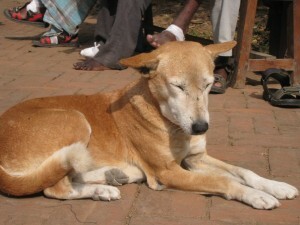 Dog warming in sun, January 2012. Photo by Phil Hunt. Leah Richards, a veterinary nurse, has a deep love, compassion, and respect for all animals and hopes to be a veterinarian one day. While at last year’s Kopan course she asked Lama Zopa Rinpoche for guidance on what to do when asked to perform euthanasia on sick and suffering animals. She wanted to know about the karma of the animal being “put to sleep;” the karma of the person performing the action; and the effect of these actions on one who has committed to the five lay vows – in particular, the vow of abstaining from killing. After all, animal euthanasia means one is deliberately killing another sentient being. Rinpoche told Leah that bodhisattvas have incredibly powerful bodhichitta and strong compassion deeply ingrained in their hearts. With such, they are willing to be born in the hell realms for the sake of another sentient being – that is, to sacrifice themselves in that way for another being. Rinpoche went on to explain that the vow of non-killing refers to abstaining from killing that is associated with and backed by ignorance and negative attachment. It is that kind of killing that creates negative karma. Only killing with a motivation that is “totally pure” becomes a virtue. Of course, one in such a position must do everything within their capacity to prevent such a compromising decision, to ascertain that there is no alternative treatment or other method at all possible – and even then, the decision is not an easy one. “The decision depends on many factors – for instance, what lies ahead in future rebirths for this being, which cannot be known to a ‘non-clairvoyant.’ A sentient being’s consciousness does not stop after this life ends,” Rinpoche said. “First, pray to Green Tara, reciting both the long and short versions of the Green Tara mantras, depending on the time available. This is a strong prayer most beneficial for the happiness of the animal. 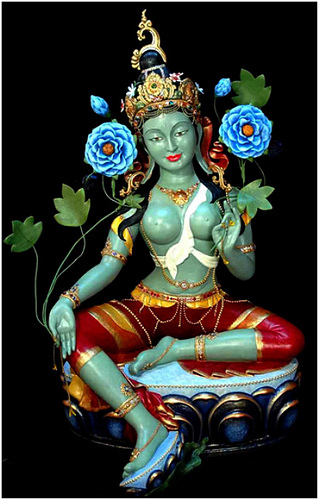 Green Tara, sculpted by Barabara McLean for the Lama Yeshe Memorial Garden at Atisha Centre in Bendigo, Australia, April 2011. Cut out small pieces of paper, all precisely the same size. On each, write one possible option (alternative possible treatments). Ensure that every possibility and alternative is included in order to obtain the most accurate outcome. Tightly roll each piece of paper up (long-ways and filament-like) and then into a ball. Take particular care that they are identical in shape and size. One can even surround each ball of paper in dough or plasticine. Hold all paper options loosely in a cupped hand. Make a strong request to the deity for a prediction as to what is the best outcome to ensure the upmost happiness of this being. Visualize light emanating from the deity out to all paper options. Have full faith in the practice and one’s own ability. While making the strong prayer, circle the hand holding the paper options clockwise, accompanied with light shaking, tossing movements back and forth as the arm moves the hand around in a circle. Whichever ball of paper is the first to fall out of the hand – act on that exact option or treatment! Secondly, recite out loud the Sutra for Entering the City of Vaishali. This will help to relieve the suffering animal, or any sentient being for that matter, from pain. It is also “extremely profitable” if one chants any or all of these mantras to the suffering, dying animal. Maitreya Buddha mantra. This is the best and most beneficial of mantras in such a circumstance. The five powerful purifying mantras (Kunrig, Buddha Mitrugpa, Namgyälma, Stainless Pinnacle, and Wish-Granting Wheel). Reciting these mantras to the animal causes many great benefits: It purifies negative karma, keeps the sentient being from ever being reborn in a lower realm, facilitates their rebirth into a higher realm; and helps them to meet and encounter the Dharma in future lives. Just hearing the mantras will lead them to the path of enlightenment. With Medicine Buddha and Chenrezig generated in your heart and while touching the animal, send out healing light and visualize purifying the sentient being before you. Chant the Chenrezig mantra and the Medicine Buddha mantra into the ear of the animal. Doing this provides the causes to purify any spirit harm and negative karma. While picturing Chenrezig hovering just above the animal’s body and visualizing light emanating out to purify all the surroundings, blow over the animal’s body. Make a strong prayer for the animal to be reborn in one of the four pure lands and to receive a perfect human body.